62 MMS September 2017 mmsonline.com CNC TECH TALK Columnist Product-producing companies tend to com- par tmentalize their depar tments, and the two most basic departments in any such company are those focused on design and manufacturing. All production begins with design engineering, where assemblies and component workpieces are conceived. Design data then are provided to manufacturing, where component workpieces are manufactured and products are assembled. Manufacturing-related departments include at least four major areas. 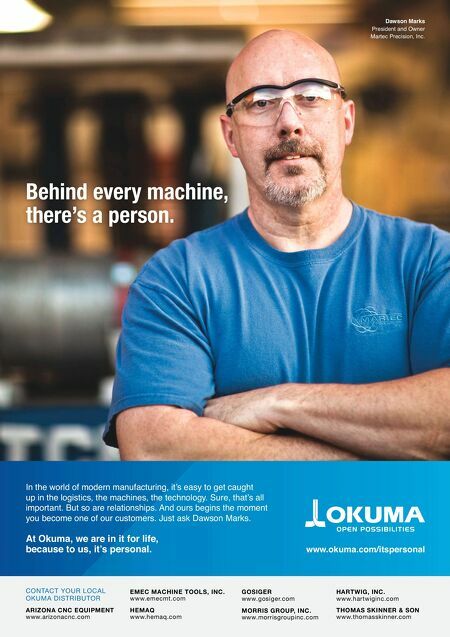 Manufacturing engineer- ing is where manufacturing processes are planned. Quality control is where control plans are created to ensure that acceptable workpieces are pro- duced. For companies that have CNC machine tools, the programming depar tment is where CNC programs are developed. And the shop floor, of course, is where all manufacturing pro- cesses are performed. All manufacturing-related depar tments are dire ctly af fe cte d by the de sign de pa r tme nt, although, in most companies, manufacturing engineering acts as a buffer for the shop floor. Indeed, manufacturing costs are simply a reflec- tion of design engineering methods. 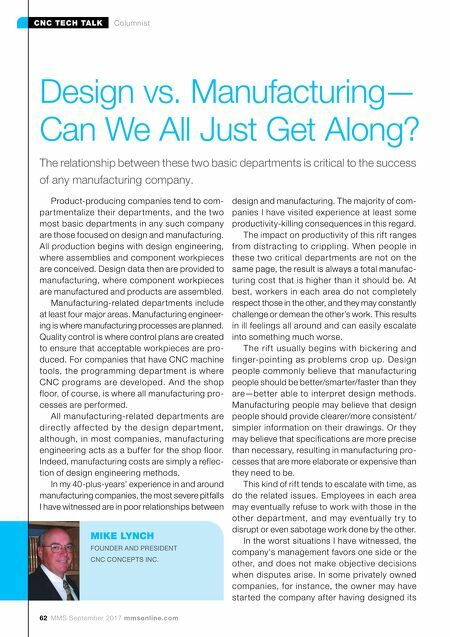 In my 40-plus-years' experience in and around manufacturing companies, the most severe pitfalls I have witnessed are in poor relationships between design and manufacturing. The majority of com- panies I have visited experience at least some productivity-killing consequences in this regard. The impact on productivity of this rift ranges from distracting to crippling. When people in these two critical depar tments are not on the same page, the result is always a total manufac- turing cost that is higher than it should be. At best, workers in each area do not completely respect those in the other, and they may constantly challenge or demean the other's work. This results in ill feelings all around and can easily escalate into something much worse. The rif t usually begins with bickering and finger-pointing as problems crop up. Design people commonly believe that manufacturing people should be better/smarter/faster than they are—better able to interpret design methods. Manufacturing people may believe that design people should provide clearer/more consistent/ simpler information on their drawings. Or they may believe that specifications are more precise than necessary, resulting in manufacturing pro- cesses that are more elaborate or expensive than they need to be. This kind of rift tends to escalate with time, as do the related issues. Employees in each area may eventually refuse to work with those in the other depar tment, and may eventually tr y to disrupt or even sabotage work done by the other. In the worst situations I have witnessed, the company's management favors one side or the other, and does not make objective decisions when disputes arise. In some privately owned companies, for instance, the owner may have started the company after having designed its Design vs. Manufacturing— Can We All Just Get Along? The relationship between these two basic departments is critical to the success of any manufacturing company. MIKE LYNCH FOUNDER AND PRESIDENT CNC CONCEPTS INC.